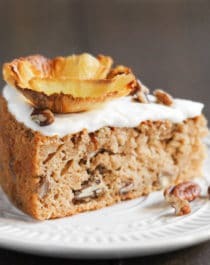 Hummingbird Cake is a tropical cake full of pineapple, banana, coconut, and pecans… and lots of calories and fat too… it’s one sinfully decadent and ULTRA tasty cake. Typical recipes call for 2 cups of white sugar, ¾ cup (or more) of oil, and bleached all purpose flour, but not this one! This HEALTHY Hummingbird Cake so delicious, sweet, moist, and decadent, you’d never know it’s lower calorie, lower fat, and lower sugar than the original. If you know anything about me (or have seen my Red Velvet Cake or French Macarons), then you know that mostly everything I bake requires trial after trial, because what usually results is error after error (after error after error after error, etc. etc. etc.). 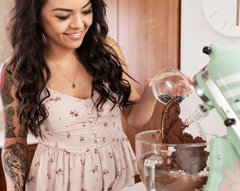 My goal is to “healthify” every single recipe I make by swapping out refined white flour, nutritionally deficient sugar, and unhealthy fats like shortening and margarine… so many of my recipes do not turn out as planned. Aaaaand that leads me to this Hummingbird Cake. I first saw a Hummingbird Cake online and it looked AMAZING. This was wayyyy back in 2011, where I was just beginning to learn the ins and outs of healthy baking. The ingredient list kinda scared me, so I thought I could swap the ingredients at a 1:1 ratio (damn, I was so wrong). I swapped the all purpose flour with whole wheat pastry flour, halved the amount sugar and replaced it with sucanat, swapped half of the oil with applesauce, and used 1 egg + 1 egg white instead of 3 eggs. At first bite, it was pretty good! But it was super tough and dry with absolutely no pineapple flavor. I also realized that I forgot to add vanilla extract, and definitely overbeat the batter (a no-no when working with whole wheat flour). I lowered the sugar even more since there was so much natural sugar already coming from the pineapple and bananas. I increased the cinnamon (PRO TIP: cinnamon can make what you’re baking taste sweeter! ), drained the canned pineapples before blending (to increase the ratio of pineapple puree:pineapple juice), added an extra banana, and remembered to add the vanilla extract! The flavor was definitely an improvement from the last trial, however this cake was far too dense — borderline mush — this time around. Back to the drawing board. For extra lift, I added baking powder, an extra egg white, and used less banana. I reduced the oil even further by adding in some yogurt, swapped the sucanat with coconut sugar and replaced some of it with pure maple syrup. 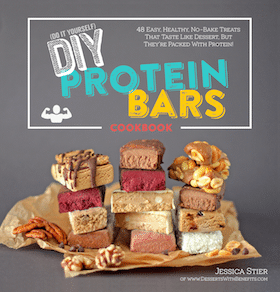 I also added a scoop of protein powder to make the cake more nutritionally balanced with healthy fats, complex carbs, fiber, and protein. 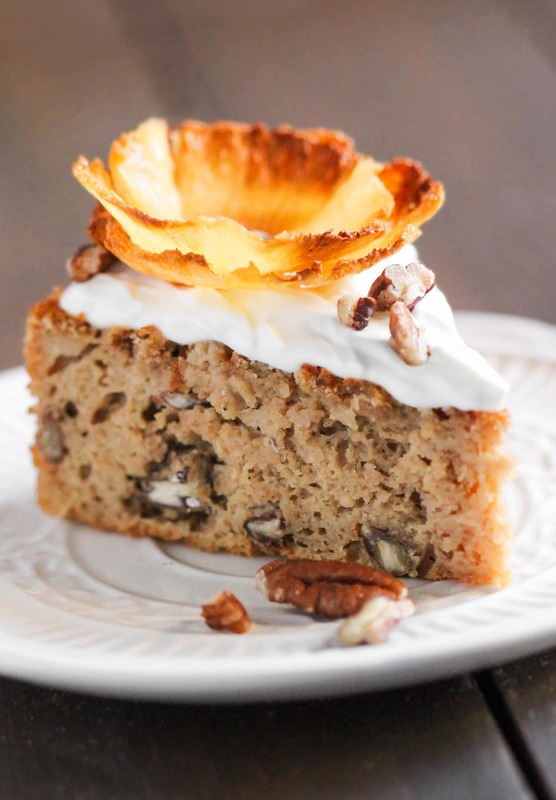 This Healthy Hummingbird Cake is DAMN DELICIOUS! It’s so sweet and moist and FULL of tropical flavors. I love the combination of pineapple, banana, and coconut. It’s seriously divine. My taste testers devoured this cake in TWO days! Hummingbird Cake is a classic cake full of pineapple, banana, coconut, and chopped pecans. This healthier version is just as sweet and moist as the original, but it's been made refined sugar free, high protein, and whole grain! Preheat the oven to 350 degrees Fahrenheit and spray an 8" cake pan with cooking spray. In a medium-sized bowl, whisk together the flour, protein powder, cinnamon, baking powder, baking soda, salt, and chopped pecans. In a blender (I used my NutriBullet), add the drained pineapple, banana, egg, egg white, yogurt, maple syrup, oil, coconut sugar, stevia extract, and vanilla extract. Puree until completely smooth. Pour over the dry ingredients and fold together. Pour the batter into prepared pan and bake for ~55 minutes or until the surface springs back when tapped. Let cool completely, flip the cake onto a serving tray or cake stand, and wrap with plastic wrap. The next day, frost with Cream Cheese Frosting and sprinkle with chopped pecans. If you're feeling a little extra, make pineapple flowers too and you've got yourself a showstopping dessert! Slice, serve, and enjoy. Keep leftovers covered and refrigerated for up to 4 days. Just as a comparison, typical Hummingbird Cake has around 700 calories, 36g fat, and a whopping 75g of sugar. Soooo yeah, this Healthy Hummingbird Cake is definitely the better choice! Those look so yummy! Love your little green loaf pan 😀 The cakes look great and sound so good. I had never heard of hummingbird cake until I was in New Zealand recently. So delish! Thanks for sharing. A new recipe to try for sure, a Hummingbird cake is new to me. A searching I shall go and see what I can come up with. I just found your website. I like that you try to make good food healthy without losing taste. O M GEEE, I absolutely LOVE this! I love HB cake, but hate hate all the overwhelming ‘badness’ in it. Thank you soooo much for playing around and figuring out a way to ‘healthify’ this delicious fruity baked good. 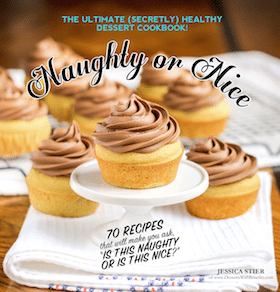 I’m bookmarking it and can’t wait to try it at some point when there’s a reason for cake! can you post the recipe you used for trial 3? thanks! interesting!! love what you’re doing!! can u post a recipe here? I will be posting the recipe soon! Oh perfect! I’ve been wanting to make a hummingbird cake, but there was always a bit too much southern hospitality in each bite, if you know what I mean. This is great that you posted up a lightened version of this! I’ll definitely have to try this recipe otu! Thanks! I like that you tried the recipe three times and didn’t give up or get turned off by the first results! Is there are reason why it’s called a Hummingbird cake? I just wanted to tell you that I made this cake a few days ago for my family’s 4th of July picnic and it was amazing! I have been wanting to make a Hummingbird cake for months now and just haven’t because I just couldn’t bring myself to make the many horribly unhealthy versions out there! I made this cake in two 8-in rounds and added pecans. I also made a frosting from fat-free cream cheese, coconut oil, vanilla extract, and powdered erythritol and it made a really beautiful, sweet, and moist cake. Everyone loved it and I was so pleased. My cousin loves sweets but is has to really watch her sugar intake so when I told her this cake had barely any sugar she was so relived and had a piece. Thanks for the recipe, I am a huge fan! This cake is very very very yummy!!! I got a big refreshment after eating it.Thank you so much for offering these important tips to bake an awesome cake.